Andrew James Bourke, better known in the transport industry as Andy, Drew or AJ, passed away suddenly on Friday, March 13 after suffering a heart attack while assisting in Victoria’s bushfire cleanup. Andy, along with his wife Maggie, founded Convoy For Kids in Victoria 18 years ago following the death of their son Shane from an asthma attack at age 14. The couple dedicated their time to the convoy to help children with asthma and other life threatening diseases and disabilities. It was an ideal endeavour for the Bourkes as Andy was a truck driver and Shane had been "absolutely mad about trucks". The funeral will take place at 11am on Thursday, March 19 at the Nielson and Handley Funeral Chapel, Warragul. Following refreshments, the cortège will leave for the Gippsland Memorial Park Crematorium Chapel at Traralgon, arriving at approximately 2.15pm. The Convoy For Kids Executive says it would like as many truck drivers as possible to attend the funeral to form Andy’s last convoy. 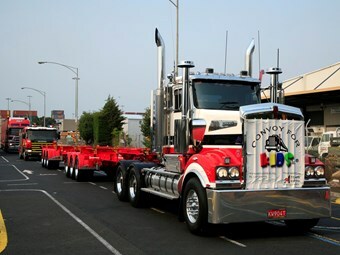 'Maggie Bourke', Convoy For Kids, PO Box 85, Park Orchards, Vic 3114.